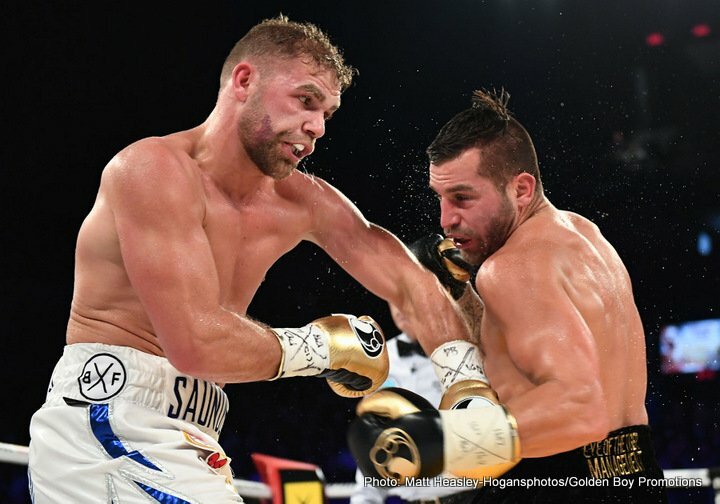 There is no doubt about it: Billy Joe Saunders turned in a quite magnificent performance last Saturday night in Canada when he totally outclassed and defused dangerous puncher David Lemieux; Saunders scoring one of the finest “away wins” from a British fighter in some time. High praise indeed, in fact too much praise? Warren doesn’t often go overboard, but it’s highly likely many fight fans will feel he has done so here. Look at Mayweather’s best showings, against the likes of: Diego Corrales, Angel Manfredy, Manny Pacquiao, Juan Manuel Marquez and others. Did Saunders’ win, as good as it was, really equal anything amongst that lot? As to whether or not GGG and/or Canelo will fight Saunders next, we will have to wait and see. But of course, Mayweather, in yet another masterful showing, has already schooled Canelo over 12 rounds. Let’s get it straight, Saunders is very good, maybe even with greatness in his future, but he is no Floyd Mayweather. As for Saunders himself, he says his preferred next fight would be one with Triple-G – “he’s the unbeatable man,” BJS said – but that he will fight anyone. Is Saunders the best middleweight in the world today? Saunders says he is definitely the slickest. On this maybe we can agree.